It doesn't get much better than cruising down the highway in a 2018 Volkswagen Beetle Convertible. 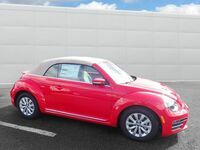 This compact car starts out as a stylish coupe and then with the push of a button, transitions into an open-top vehicle that turns heads wherever it goes. 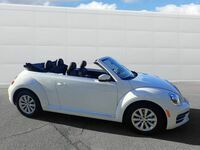 The new Beetle Convertible's traditional soft top allows for more space than a folding hardtop, freeing up more trunk space for all your adventures and providing you with the ability to be raised and lowered automatically at driving speeds of up to 31 miles per hour. Want even more fun in the sun? 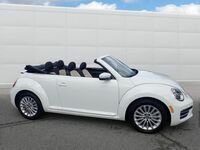 Check out the 2018 Volkswagen Beetle Convertible Coast, a newly introduced model that is perfect for those long trips to the beach. 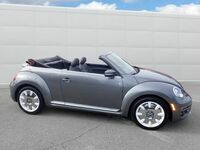 The new Beetle Convertible Coast comes standard with surf-inspired features like a unique Deep Sea Teal exterior color option, a surfboard wood-look dashpad, and cloth seating surfaces in “Pepita” houndstooth. You will also find Monster Mats®, scuff plates, and a Blind Spot Monitor with Rear Traffic Alert to help give you confidence when pulling into a busy beach parking lot. Every 2018 Volkswagen Beetle Convertible comes with some form of infotainment, whether it's the Composition Color unit with a 5-inch touchscreen display in the Beetle Convertible S or the 6.3-inch capacitive Composition Media touchscreen display in the Beetle Convertible SE. Put the top down in your new Beetle Convertible and you'll feel like you’re flying thanks to a new 2.0-liter four-cylinder turbocharged, direct-injection TSI engine that is paired with a 6-speed automatic transmission with Tiptronic® and Sport mode. Want to see the 2018 Volkswagen Beetle for yourself? Then stop by Dirito Brothers Volkswagen of Walnut Creek and take one for a test drive today!